Mr. Earnest Wayne Weaver was born May 24, 1881, in the State of Illinois. (The exact locality is not yet known to us). He died at his home in Bronaugh, Missouri, July 14, 1914 after falling asleep about two o'clock in the morning after ......... gasping for breath. He was thirty three years, one month and ... days of age. The deceased was married to Miss Betty Gregory, March 19, 1905. To this union three children were born, all of which are still living. The cause of Mr. Weaver's death was injuries sustained in the explosion of a steam engine owned by the Doores Brothers and for some years operated by Mr. Weaver. The outfit was engaged in threshing for Mr. Renfer, when the accident occurred, the exact cause of the explosion is not certainly known. It is practically certain that lack of sufficient water, the usual cause of such explosions, was not the trouble. The condition of the wreckage and Mr. Weaver's carefulness call for some other cause. On 19 Mar 1905, Earnest married Miss Bettie Gregory in Vernon County, MO. She was a daughter of Henderson Gregory and his late wife Dinah. Welborn Cemetery records show that he was buried beside his sister Bertha E. Weaver, November 4, 1889 to November 27, 1907. The grave markers note that their parents were Reuben Weaver and Sally Smith Weaver. It appears that most of the family moved west especially to Washington state. The 1920 Census for Prosser, Benton County, Washington shows Betty Weaver, age 39, a widow; Floyd Weaver, age 13; Geneva Weaver, age 5 and Eva Gregory, age 35. Earnest's obituary says they had three children. Clestile (Clesteel) Fern Weaver was born December 5, 1911 and died March 16, 1915 of meningitis. Her death certificate and obituary tells that she was buried at Welborn Cemetery (but apparently in an unmarked grave). The 1930 Census shows Betty was still living in Prosser with her 15 year old daughter. Obituary for Clesteel Fern Weaver from March 17, 1915 Bronaugh Journal. 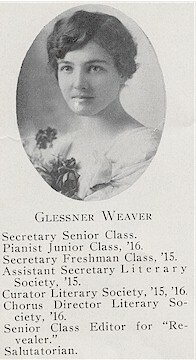 Glessner Weaver was a senior at Moundville High School in 1917. William Weaver married Alice Whiteside on February 5, 1899, in Vernon County, MO. 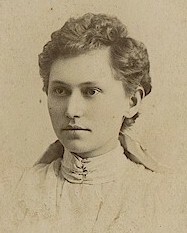 Robenia Weaver was probably a student at Cooper College in 1894. She was a daughter of Joseph and Martha Weaver of Metz in north Vernon County. Robenia gets spelled a variety of ways in census records - Rovena, Robena, R. E..
Nancy Thompson reports a marriage for J. W. Davis (groom) to R. E. Weaver (bride) on Dec 30, 1897. The groom was from Partridge, Reno Co., KS. They then moved to Kansas and resided in Reno County for many years. They had daughters Laverna and Mary. So it appears that she is an example of a student who came to Moundville to attend college and then left. There is no evidence that this family was related to the other Weavers of Moundville (above). If you have Weaver information to share or questions please let us know.